The top-ranked Fighting Irish collect their 11th consecutive victory. SOUTH BEND, Ind. —Arike Ogunbowale scored 24 points to lead all five starters in double figures Sunday as No. 1 Notre Dame beat Boston College 92-63 for its 11th straight win. 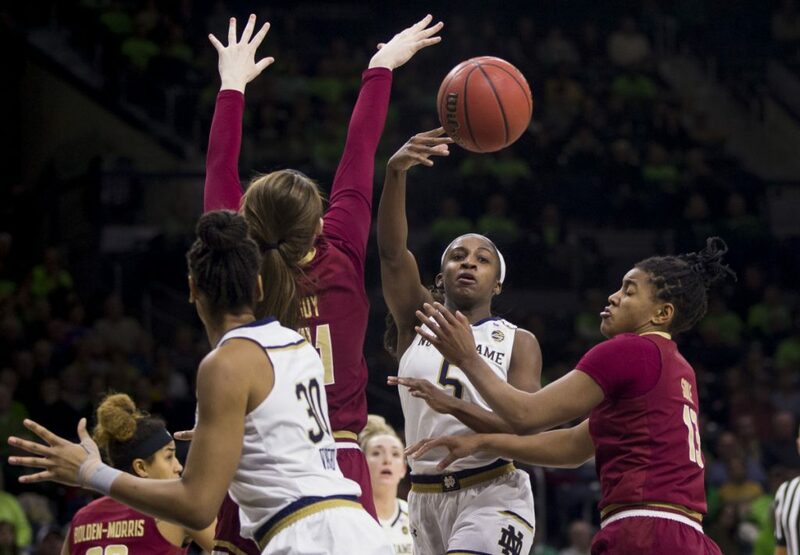 Jackie Young had 18 points, 13 rebounds, four assists and three steals for the Fighting Irish (18-1, 6-0 Atlantic Coast). Jessica Shepard added 11 points, 10 rebounds and a team-high six assists. Brianna Turner finished with 16 points and Marina Mabrey had 14. Freshman Taylor Soule scored 18 points and Makayla Dickens had 12 for the Eagles (13-6, 2-4). (2) BAYLOR 79, WEST VIRGINIA 47: Kalani Brown scored 17 points as Baylor (15-1, 5-0 Big 12) beat West Virginia (12-5, 3-3) at Waco, Texas. The Bears shot 50 percent from the floor, including 58 percent in a dominant first half. (4) LOUISVILLE 73, WAKE FOREST 49: Arica Carter scored 12 points, Bionca Dunham had 10 and Louisville (17-1, 5-1 Atlantic Coast) used 3-point shooting and trapping defense to beat Wake Forest (9-9, 0-5) at Winston-Salem, North Carolina. (5) OREGON 93, ARIZONA 60: Sabrina Ionescu posted her NCAA-record 16th career triple-double, and Satou Sabally scored 18 of her 25 points in the first quarter as Oregon (17-1, 6-0 Pac-12) raced past Arizona (13-5, 3-4) at Eugene, Oregon, for its 10th consecutive win. (6) STANFORD 85, WASHINGTON STATE 64: Hall of Fame coach Tara VanDerveer won her 900th game in 33 seasons at Stanford as the Cardinal (16-1, 6-0 Pac-12) beat visiting Washington State (7-11, 2-5). (8) NORTH CAROLINA STATE 70, VIRGINIA TECH 61: Kiara Leslie scored 25 points and Aislinn Konig made a go-ahead 3-pointer in overtime as North Carolina State (18-0, 5-0 Atlantic Coast) topped Virginia Tech (13-5, 0-5) at Raleigh, North Carolina. (9) MARYLAND 79, PENN STATE 67: Taylor Mikesell scored 23 points, Kaila Charles added 19 and Maryland (16-2, 5-2 Big Ten)beat Penn State (9-9, 2-5) at College Park, Maryland. BOSTON COLLEGE 87, (11) FLORIDA STATE 82: Ky Bowman scored 37 points and Jordan Chatman gave Boston College (10-7, 1-4 Atlantic Coast) the lead for good by hitting three straight 3-pointers during a 21-4 run to start the second half against visiting Florida State (13-5, 1-4).